The DE series of electric actuators are ultra-compact and provide a high output-to-size ratio. In addition, the DE series has a multitude of features not normally found in this class of actuator. 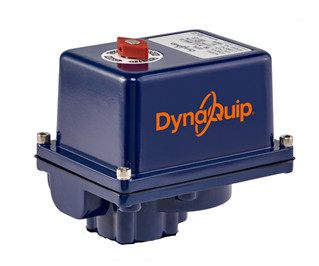 DynaQuip Electric actuators provide a solid foundation for automating almost any quarter-turn application. Electric actuators are used where plant air and compressors are not available. They are the actuators of choice in cold temperatures corrosive environments and are easily integrated into distributed control systems. Automating ball, butterfly, and plug valves are the primary application of most end users. In addition to our pre-sized automated assemblies DynaQuip Controls can provide actuators and hardware to automated existing valves of other brands and manufacturers.